How can you possibly make a sequel to one of the most famous and influential games of all time? Blizzard's Dustin Browder, Lead Designer of StarCraft II, spoke to The Escapist about trying to surpass the legendary StarCraft. When Browder joined Blizzard in 2005 as the Lead Designer on StarCraft II, he was hardly a newbie to RTS design - he'd previously led the charge on games like Command & Conquer: Red Alert 2 and The Lord of the Rings: The Battle for Middle-Earth - but that didn't necessarily mean he was prepared for the task ahead of him. It was more than merely overwhelming. "Let's call it 'terrifying' - that'd be much more accurate," laughs Browder. "The fanbase for the original StarCraft is extremely enthusiastic, and rightly so. 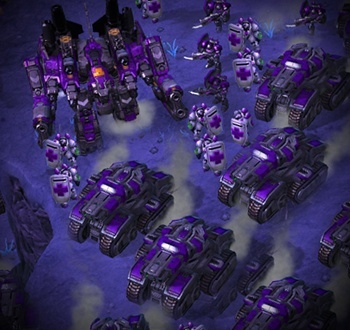 We're talking about arguably the best RTS of all time, right? You can just sense the enthusiasm for this product." Browder wasn't a part of the team that developed the original StarCraft, but he identifies himself as an ardent player and fan who played the game "for many, many years," and who, as a designer, tried to apply "many of [StarCraft's] design sensibilities" to his own games. However, that did little to make the job of building a sequel any less daunting. To read more about the tremendous task in front of Dustin Browder - and how he and his team are tackling it - read "A Master Craftsman" in Issue 248 of The Escapist.